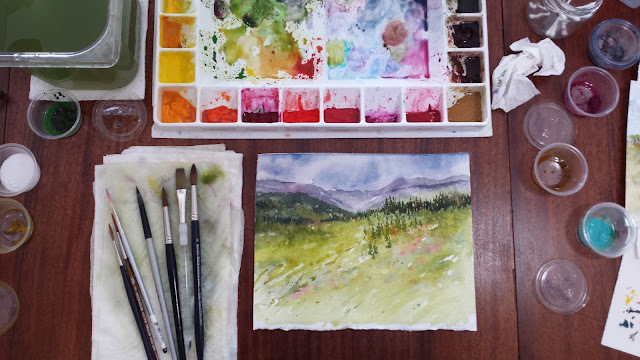 It's been a while but I'm here today and I've got some new watercolors in progress. Because my art time is so limited now, the most recent projects are different. I tend to work very tight, controlled and detailed when I paint. Stepping out of my usual habits is forcing me to grow as an artist. (The one here on far left is described more further on below.) 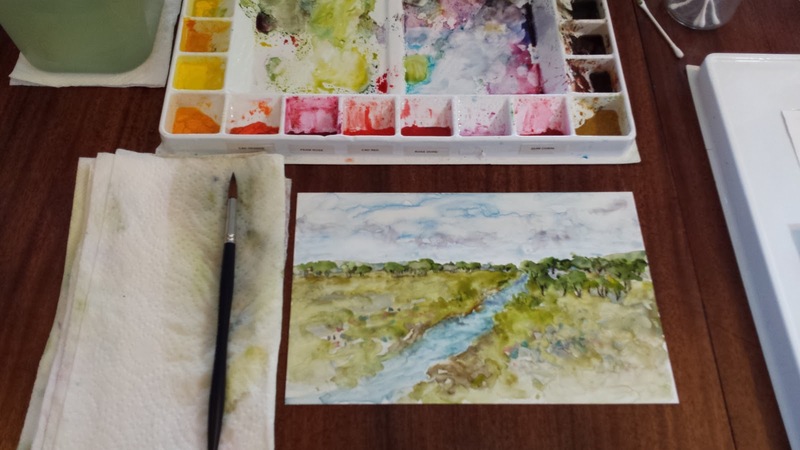 Can you relate with the struggle, working more tight and detail-focused in your own artwork? Along the way, some tips on challenging yourself to be more loose with the brush and working less controlled in your own artwork. 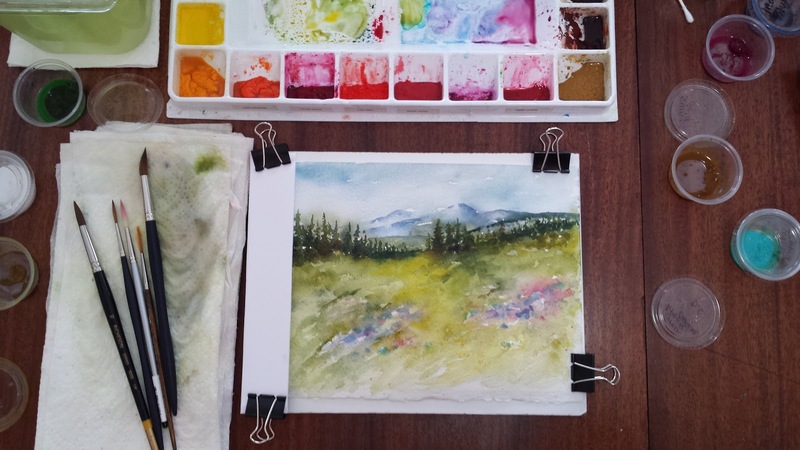 The two paintings below are watercolors on Yupo surface. It's not paper. It's a plastic surface for watermedia or mixed media. It takes some time and patience to work with in my experience. With practice, it's been easier to adapt my strokes for a better result. I enjoy working with this surface very much even though I've been so tight in my style for a long time. The genius of this surface is it can all be rinsed and wiped away for a fresh new start. The first landscape is done with a reference photo and the second landscape is just a fun imaginative journey. Can you relate with the struggle, working more tight and detail-focused in your own artwork? 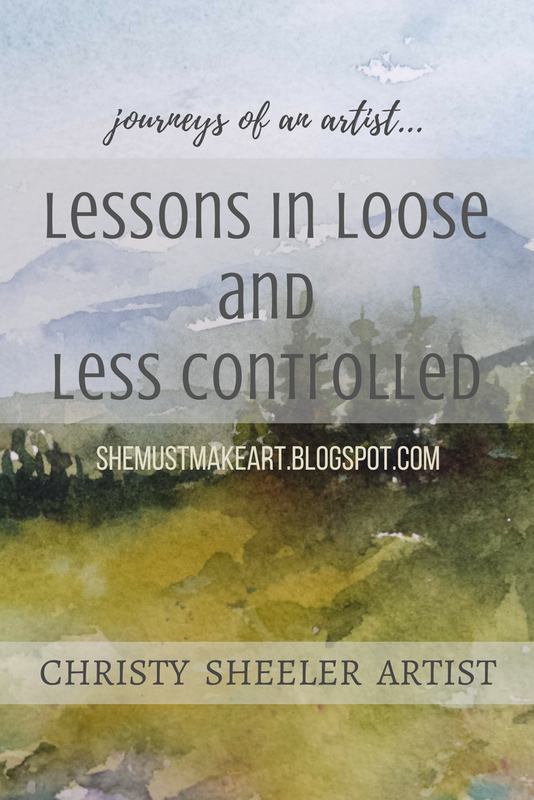 In this post, 10 Tips for Working Loose and Less Controlled. I wanted to keep myself painting even when my schedule is working against me. She has such a positive way with explaining and she's easy to follow when she teaches. I would say that if you are curious about taking lessons...go check out her courses. You will enjoy yourself and she can take you from basics to advanced skills. Here is the beginning stage of my project following along with her instruction. 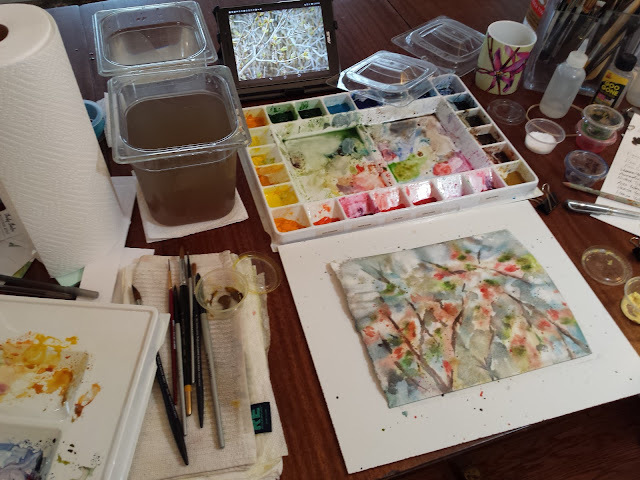 This was my first time completely soaking my paper before beginning the first layer of color. I loved this and enjoyed the time in my art room very much! It's a mystery what will come of it and that's the fun of it. 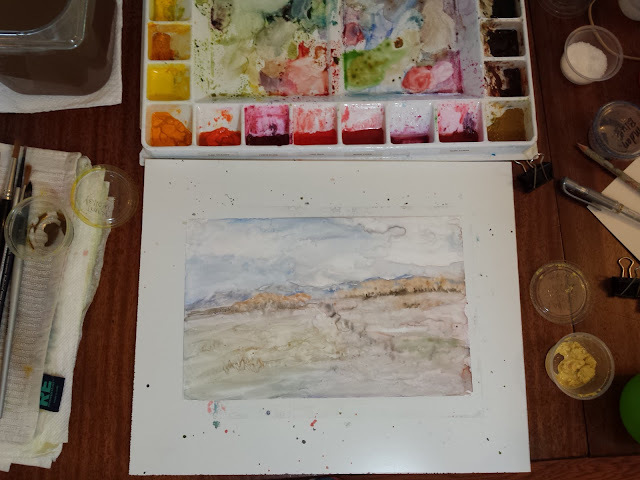 The second photo below is further on in next stages...once the first layer of watercolor was dry. This is the second project done with the online course. 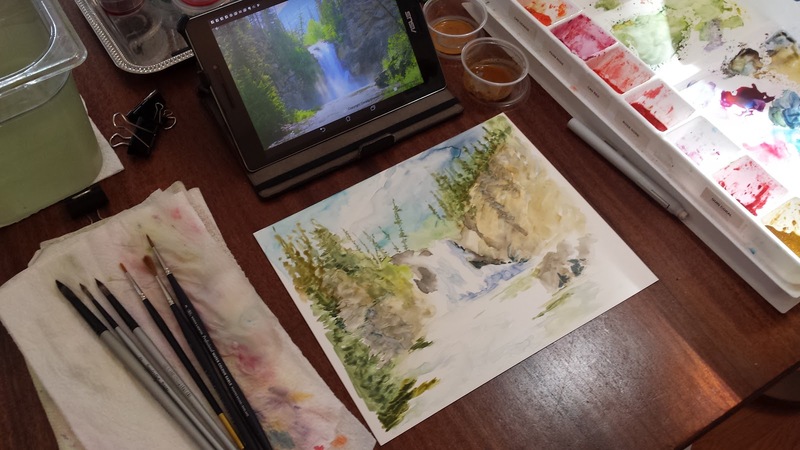 She provides the art reference photos and they can be downloaded onto a pc or other device. 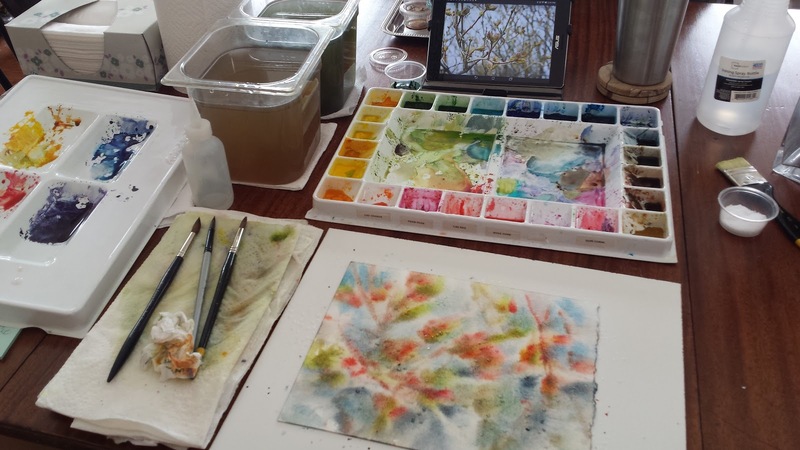 I had the photos downloaded onto my tablet so I could see them at my art table. The third of my works done through her online course is below. This was an exercise in negative painting which is painting around an object to reveal its shape. I was familiar with the technique but not excited to use it often. It's a challenge to be sure! 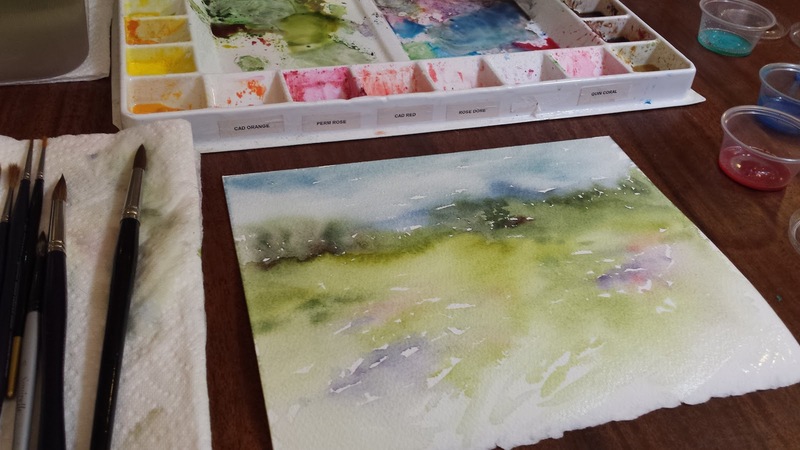 She shares quite a few tips for making the negative painting process not so overwhelming. This is the one I've chosen to revisit today but it didn't go very well. If I'd seen this photo (taken over a month ago) while working on it today, I'd be much happier. I faced two major problems. The first, I couldn't remember which photograph I'd used for this project. I searched and guessed it to be a similar photograph to the one showing below. The second problem, I think I turned the painting upside down. Ugh. See, the work doesn't always go as originally hoped for in my art room, too. I can scrap it altogether or I can see what can be done now. Maybe this is the time to try washing it all off? I'm not sure what I'll decide to do at this point. The two photos below were taken after my painting time today. I see that I chose the wrong photograph but right subject. 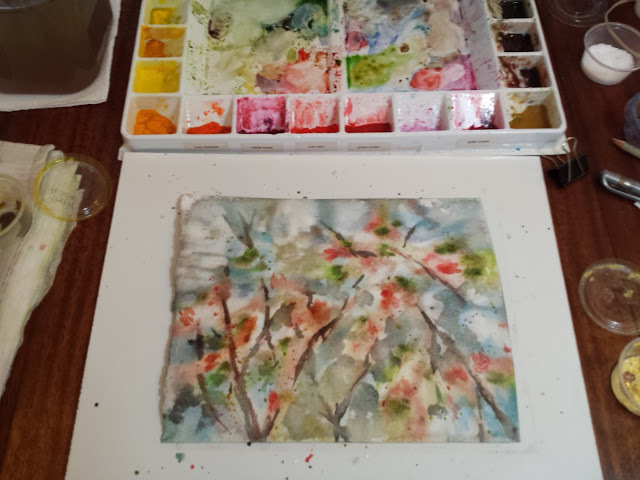 The watercolor paper should have been spun around but it could work as it is now. Tough decision. Not sure what I'll decide to do now. Today's warm up session was a quick landscape on Yupo surface. It's done loosely with pale colors. I used an art reference photo taken just a few weeks ago. I don't love this one but I'm showing it anyway because you might think I turn out nothing but work that I love in the end. It's so much more pale than my usual work. It's an exercise in branching out for color scheme and less vibrant. It's also on Yupo...so I will probably wash it all away and try again. Love that about Yupo! It's been more productive in the art room for March, April and May in 2018. Spring of 2017, I wasn't painting much at all. I've been checking back to answer comments here as well as email. If you've got questions, don't hesitate to contact me. I'll get back to you as soon as I am able, usually 5-7 days. Sheesh! It's June now! The days just fly by now. 1. Block out the need to have an artwork for mat and frame. Nobody has time for that pressure! 2. 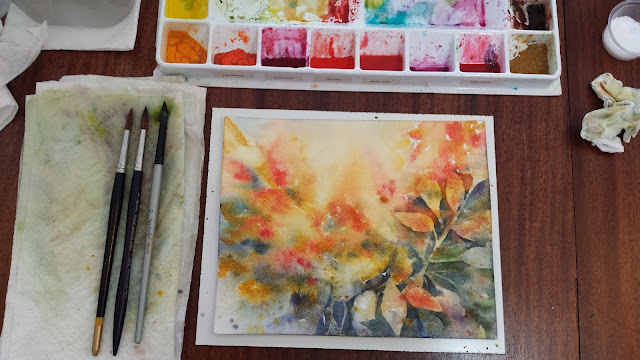 Take 10-15 minutes to play on a smaller scrap of paper. No expectations. Warm up your mind and subconscious for creative energy to flow better. 3. Try a new way of starting...like soaking the paper. Be adventurous! 4. Have an open mind about supplies and tools and techniques. What would happen if...? 5. Watch a painting tutorial that inspires you and then GO DO it yourself. YouTube is full of great videos that cost nothing. 6. Be more aware of your self talk. It's not just you thinking, "oh, what should I do now,"
or "well, that didn't work the way I wanted," and "what should I do about this area?" my mind off of it for a while. 7. This is hard work to move out of our comfort zone. Don't expect it to come easily or quickly. This retrains the brain, the eye, the hand, and the creative process. Learning takes a lot of energy. relieve anxiety of needing direction. Ask yourself how YOU want to paint this. match what the photo shows for accuracy. because this paper cost a pretty penny! Paint on both sides of the paper. Use it up. Try washing the painting off...I'm going to try this soon. Don't use cheaper paper. now and it took years for me to get to that point. YUPO! Yupo is amazing. It's a bit more money but you can really wash away all the paint and start again. Rinsing it off in the sink will not damage it at all. Stains? Magic eraser. 10. Do it all again. Go back and remember the new methods. Write yourself some reminders. Repetition and reminders help us keep the new way of thinking and creating for the long term. Thank you for stopping by the blog today! Be sure to leave a hello in the comments. You can find me on Instagram, Facebook, and Pinterest. I'm most actively posting on Instagram these days because it's so quick and easy.